Of course, the Gregorian calendar isn’t the only calendar system that has been used over the course of history. Some alternatives that spring to mind (some of which are still used) include the Julian Calendar, the Islamic calendar, the Chinese Calendar and the Roman Calendar. Check out www.fourmilab.ch/documents/calendar/ for a few more examples. Unix time was created back in the 1970s to serve the time keeping needs of the first Unix based computers and it has been used by many operating systems ever since. Unix time is very simple – it consists of nothing more than an integer which represents the number of seconds that have elapsed since 00:00 Universal time on January 1, 1970 in the Gregorian calendar. This may seem like an odd date to start a calendar but they had to start somewhere and it coudn’t be too early since the Unix time had to fit into a 32bit integer. So why am I telling you this you may wonder? Well, the Unix time will soon be 1234567890 which I find fun since I am a numbers nerd. Since I live in the UK this will correspond to February 13, 2009 at 23:31:30 and I intend to celebrate (well it’s as good a reason as any)! Something else that I recently discovered about the number 1234567890 is that both 1234567890 + 1 and 1234567890^2 + 1 are prime (originally from Prime Curios but verified by me using Mathematica). Finally, if 1234567890 is not interesting enough for you then maybe you are more impressed with the palindromic time of 1234554321 which occurs a few hours earlier – Fri 13 Feb 2009 19:45:21 UTC to be precise. *As I type this I consider the possibility that there is a formal definition of the term ‘calendar’ and that Unix Time doesn’t fulfill it for some reason. Feel free to correct me in the comments if this is the case. Mathematica turns 20 – Math geeks drink champagne in cave! I have just returned from the 9th International Mathematica Symposium which was held in Maastricht last week where, among other things, we celebrated the 20th anniversary of the release of Mathematica. 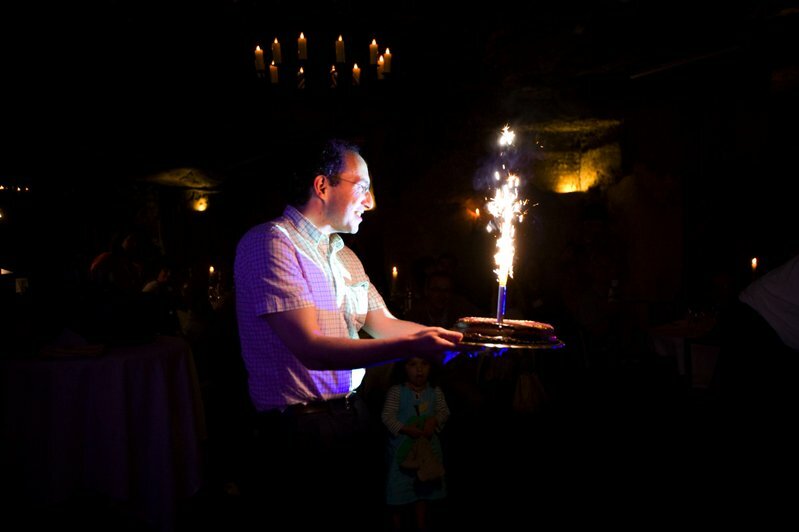 The birthday itself was on June 23rd and, as luck would have it, this was also the day of the conference dinner at the wonderful man-made caves of Geulhem so all of the IMS delegates celebrated in style. I will write more about the conference itself in a future post – once I get hold of the some of the photos. For now, I simply wanted to highlight the fact that Wolfram have made a scrapbook that shows some of their developments over the last 20 years. 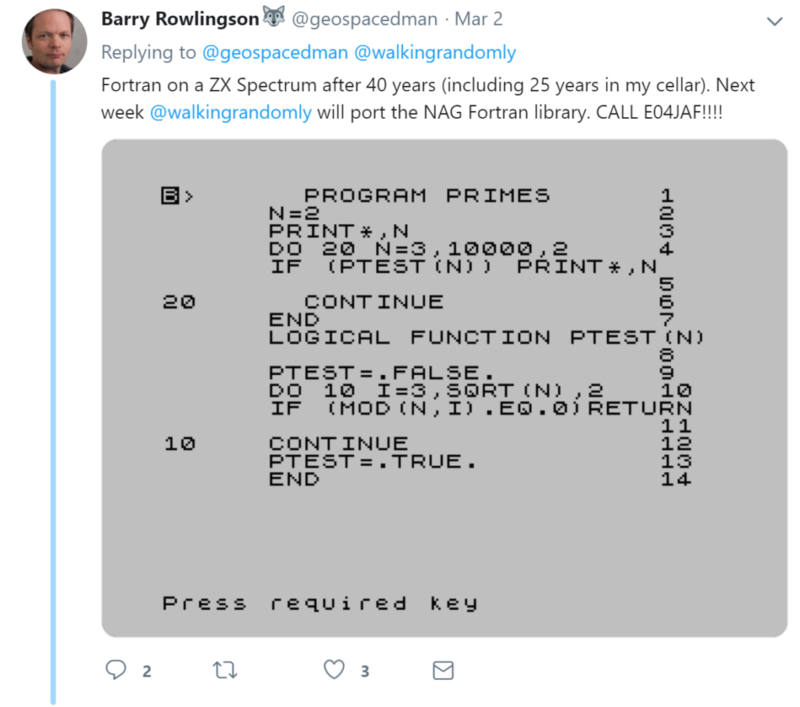 We were shown a preview of it at IMS and I think there is some great material there including the complete manual for Mathematica’s predecessor, SMP (Symbolic Manipulation Program) – great for getting a flavour of how computer algebra was done in the 1980’s. While on the subject of SMP – there is a couple of screenshots of it running on a minicomputer. If you have never heard this term before you might be forgiven for thinking that a minicomputers were small, but in fact they were only small compared to the gigantic mainframes of the day. Essentially a minicomputer was the size of a two or three family washing machines as compared to the size of a house for a mainframe (or something like that – I was only 10 at the time so can’t remember!). If anyone is looking for a project, it would be very cool to get a copy of the original SMP code to work on a modern mini-computer such as a mobile phone. I wonder what the license issues are…. There are also details of the early development of the Mathematica language. What I find interesting here is how much of the early ideas survive in the present system. For me, reading code from that 20 year old dialect of Mathematica felt a little like reading victorian english – slightly odd but perfectly understandable. I also enjoyed reading the media reactions to those early versions…one entitled “Twilight of the pencil?” by William Press for example. I find it interesting that, despite the remarkable evolution of packages such as Mathematica over the last two decades, I have yet to find a Mathematician who never does any pencil and paper maths. I remember when I first discovered Mathematica ,version 3.0 I think it was, running on some sort of ancient Unix based system which my University had christened Newton. It was in the first month of my PhD and I had been wrestling with some terrifying looking (to a freshly minted grad student at least) integrals that were taking me ages to evaluate by hand. My PhD supervisor was a symbolic integration master and during this phase of my work I was learning loads of shortcuts and tricks that you never get taught as an undergraduate. Even with these tricks though, the work was starting to get out of hand. 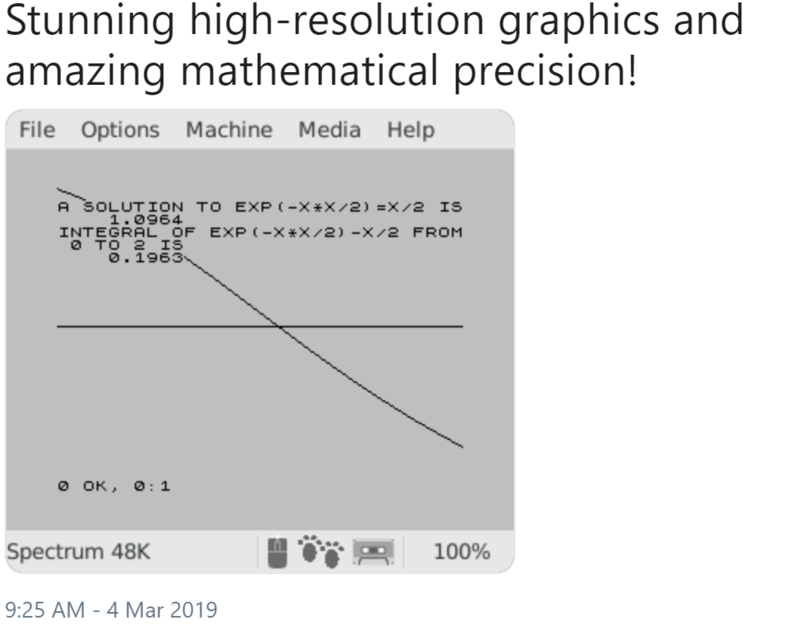 It took a day to find the name of the machine with Mathematica installed, another day to find said machine, 5 minutes to learn how to feed my problem to Mathematica and then about 30 seconds to reproduce several days worth of manual labour. I was in love! You would think that the pace of my research would have accelerated but I got very sidetracked learning what else I could do with my new toy. If you have any stories concerning your early Mathematica experiences, feel free to share them in the comments section. I work at the University of Manchester which is where the world’s first ever stored-program electronic digital computer was made back in 1948. It was originally called the Manchester Small Scale Experimental Machine but everyone called it Baby and it didn’t occur to it to mind. Before I get flamed to death by US computer historians – yes the ENIAC was built 2 years before Baby but it had a fundamentally different architecure (as explained by Alan Burlison in his blog – here). As Alan says, if you wanted to reprogram ENIAC, you needed a pair of pliars. Many people who are a lot more eloquent than me have written a lot about the history of this machine (here for example) so I won’t say too much about it here except that it had only 128 bytes of memory which were arranged in 32 x 32 bit binary words and that it had an instruction set of only 7 commands which made programming it a bit tricky to say the least. If you think you are a real programmer who is up to the challenge of coding for a 60 year old machine then Manchester University is holding a program “The Baby” competition (closing date 1 May 2008) to celebrate the Baby’s 60th anniversary. 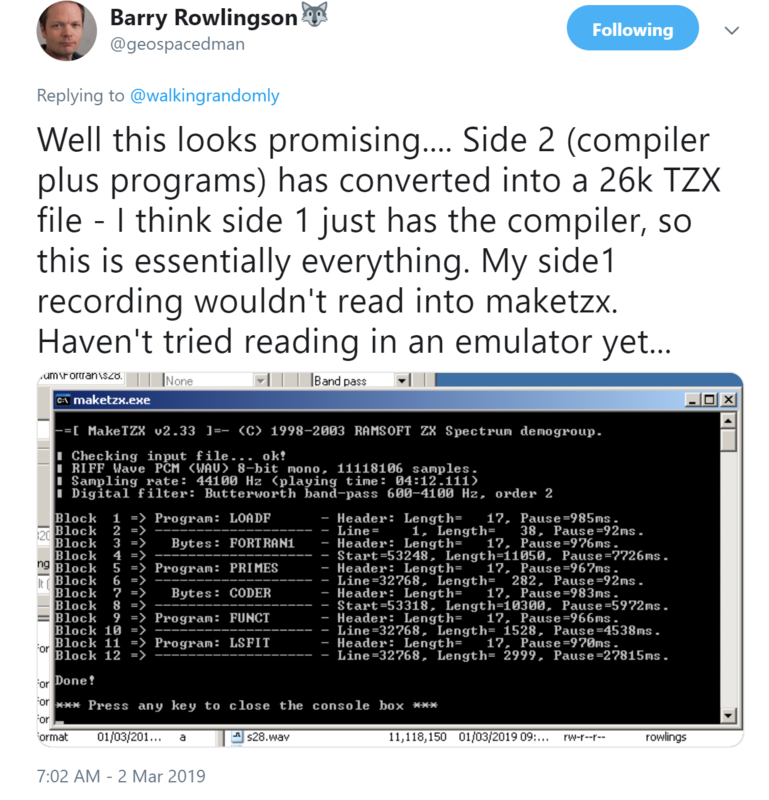 There is a photo realistic Java-based simulator of the machine, complete with example programs, over at the competition website along with an instruction manual to get you started. With only 7 instructions to learn how hard can it be? 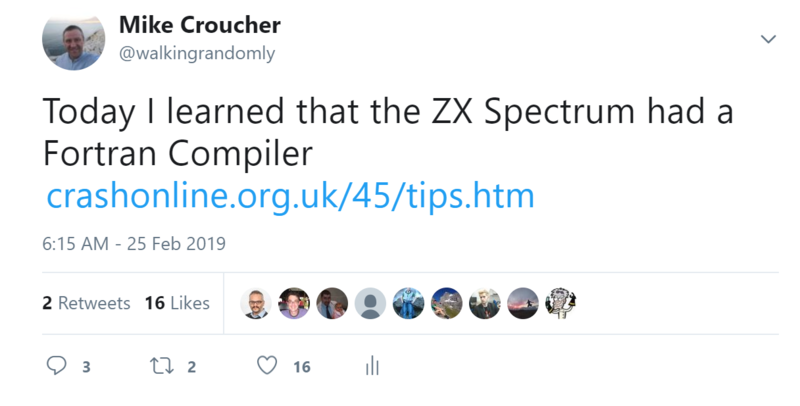 On the morning of my 8th birthday my life was changed forever when I received a shiny new 48k ZX Spectrum + – the year was 1985 and this event signified the beginning of my love affair with computers. Back then the school playground was divided into two main camps – those of us who had Sinclair Spectrums and those who had a Commodore 64 and the rivalry was fierce – I even remember once being involved in a fist fight that started with a Speccy vs Commodore argument (it was probably the most pathetic punch up ever – 8 year old proto-geeks are not well known for their fighting prowess). 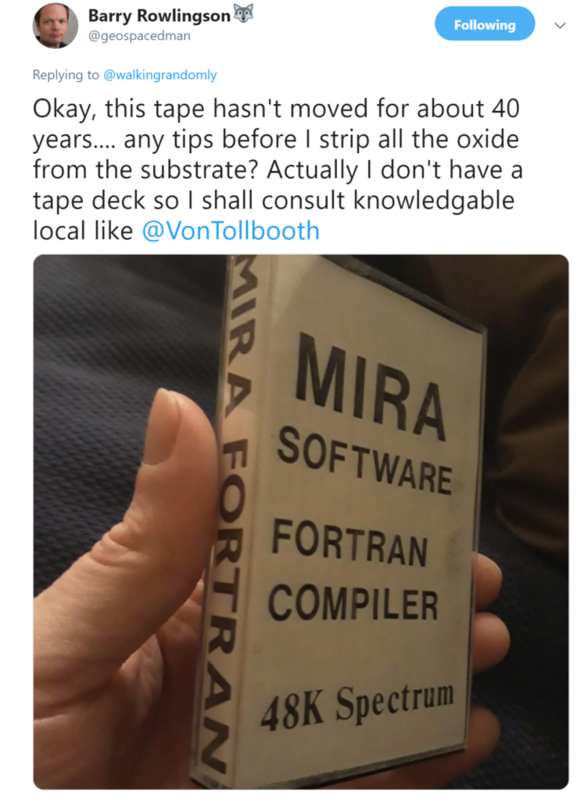 Of course there was the occasional oddball who had something weird like an Amstrad CPC464 (or in the case of my mate Tom – an Oric of all things) but in the main it was C64 v Spectrum and, I guess, this was my first ever technical holy war (and the only one that ended up with a physical fight). 22 years later and, like all first loves, the Speccy still holds a place in my heart but my opinions are not as polarised as they once were. 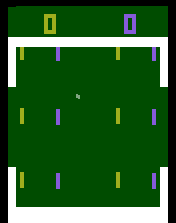 These days I occasionally admit that the C64 was a good machine and, when no one is looking, I might fire up an emulator to have a game on something like the Great Giana Sisters or Wizball (the spectrum version was a bit poor you see). One thing that I simply cannot deny is that the music on the Spectrum was just plain awful whereas that of the Commodore was quite simply stunning for its time. The sound chip on the C64 was called the Sound Interface Device (SID) and was probably the most advanced sound chip on any 8-bit home computer. 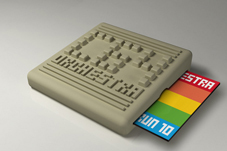 Game designers used the chip to great effect in titles such as International Karate, Spellbound and R-Type – this stuff was as close as you could get to ‘proper music’ on an 8-bit computer. Now it’s not exacty cheap – once postage and packing was taken into account it cost almost 30 pounds but I just had to order it. Expect a review here soon.